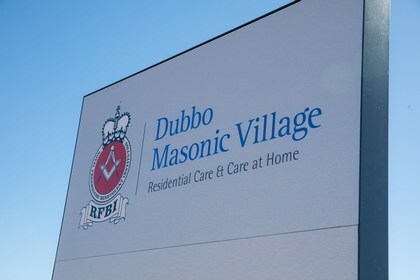 Dubbo, NSW — The new RFBI Dubbo Masonic Village in Dubbo deserves some congratulations, for bringing to the community an innovative new approach to retirement and aged care living. The Royal Freemasons Benevolent Institution’s new residential care village will be the first in the Orana Region to offer a client concierge and communication platform, CareVision, to residents, their families, friends and the wider community. “CareVision bridges the gaps between the stakeholders in Aged Care through a TV and Mobile solution that is easy to use, customisable, and even fun. We have focused on the needs and wants of care recipients and their families and found practical and effective ways to re-connect them, reduce social isolation, and improve communications” said Irene Ryan, CEO of CareVision during a recent site visit to Dubbo. With the recent reports into aged care highlighting the need for greater family involvement and cooperation between providers and families, it is great to see our local RFBI Dubbo Masonic Village doing something about it, ahead of the curve. The platform enables family and friends to send messages, photos and videos from their mobile apps straight to their loved ones’ in-room television which are displayed when the TV is turned on, or the resident can be notified of the new messages while watching their favourite TV shows or interactive content from CareVision. Residents can respond back, making the humble TV into a powerful two-way communication platform for families. But it’s more than simple communications that make CareVision a new approach to retirement and aged care living, according to Ms Ryan, it is about nurturing a wider community of support beyond the boundary of the physical village. Getting settled in a new location can be difficult and distressing, we have found that with CareVision, residents stay connected with family and friends more effectively, assisting with the transition. Furthermore, the platform facilitates friendship building within the village matching people of similar interests or backgrounds for an introduction if they wish. To know more about CareVision, watch a demo video and for information regarding RFBI, visit rfbi.com.au. Subscribe to get access to our recent case study on financially viable digital concierge implementation, along with whitepapers and eBooks for the retirement living and care sector.